"PC/104 architecture: the key to embedded system success"
By using the compact PC-compatible open standard, systems manufacturers can reduce the size of their control system and gain flexibility. 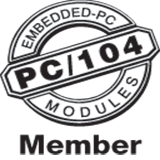 "PC/104 Outlook: how will PCI impact PC/104?" Before looking ahead and trying to predict how PCI will affect PC/104, we need to remember the evolution of the embedded PC that was popularized by PC/104. "Smaller, faster, less expensive - NOW!" "Do the economic principles of the PC marketplace really apply to embedded solutions?" "High-speed data acquisition technologies push PC/104 into new markets"
New, low-power, high frequency IC processes coupled with ever shrinking package sizes are allowing high-performance ICs to squeeze into spaces that were inconceivable just a few years ago.